Residents of Iqaluit, Nunavut woke up on Tuesday morning seeing red — literally. The city took on a strange rose hue throughout the day, wowing residents and leading to plenty of theories. Residents of Iqaluit, Nunavut woke up on Tuesday morning seeing red — literally. The city took on a strange rose hue throughout the day, wowing residents and leading to plenty of theories. 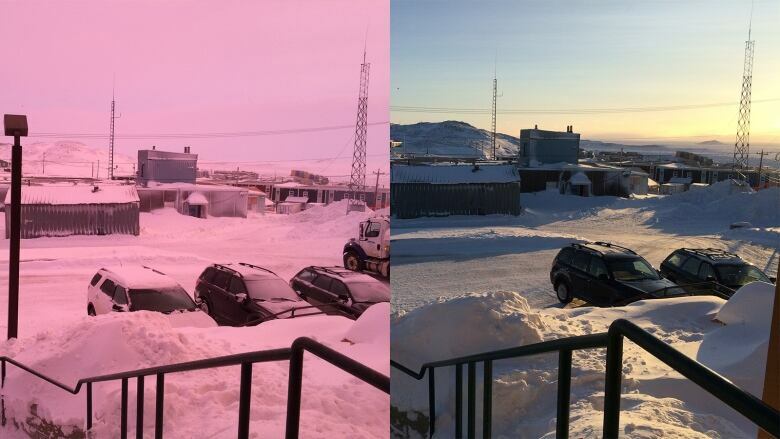 CBC North's Nick Murray snapped a photo of the colouration outside CBC's Iqaluit bureau, which was shared widely across Facebook and Twitter. By Wednesday afternoon, the photo had reached nearly 200,000 people on CBC's Facebook pages alone. 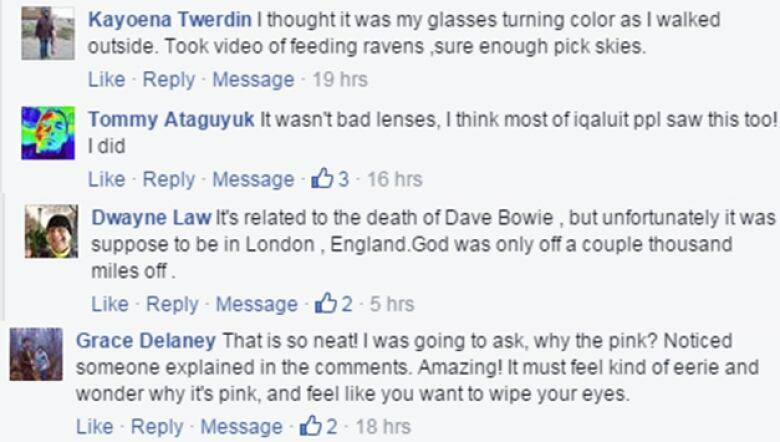 The photo was quickly confirmed by other Iqaluit residents, some of which had their own theories. "Ziggy Stardust just flew by," commented Kevin Robinson, a reference to the recent passing of David Bowie. "Is it be cuz [sic] of your sunglasses?" asked Susie Pinguatuq, commenting on CBC Nunavut's Facebook page. However, the likely answer for the strange colouration isn't related to pop icons, or eyewear: instead, it's rooted in how light reacts with the atmosphere. CBC North meteorologist Ashley Brauweiler says Iqaluit's red sky is likely a result of light scattering, where sunlight is reflected through particles in the atmosphere. The colouring was also likely intensified by the time of day the photo was taken — near sunset — when the sun is lower in the sky. "When the sun is at a low angle in the sky, the light has a longer distance to travel," said Brauweiler. "The blue [colouration, which leads to a more common 'blue sky'] gets removed by the ice crystals and salt in the air, which leaves red visible." "The clouds are much larger than light waves, which allows them to take on the colour, in this case pink."